Welcome to the International Space Station (ISS), Astronaut. In Station Spacewalk Game you'll experience the thrill of conducting NASA repair work on the International Space Station. After negotiating your way through the airlock, you, the astronaut, will be tasked with jobs critical to help power up the space station so it can continue to operate. First take your time to explore the station, but then it's time to get to work. You'll have to move quickly and carefully, with a limited quantity of oxygen you must complete your Extravehicular Activities (EVAs) and get back into the airlock before your air supply runs out. 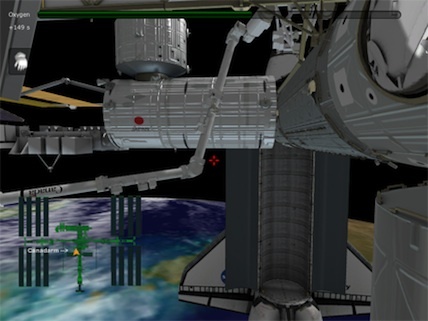 This video game features simulations of actual EVAs conducted by NASA astronauts on missions to provide power to the space station. The graphics used in this game are based on real NASA missions and incorporate 3D graphics used by the Agency. Explore the ISS. Before you get started with your EVAs, feel free to explore the ISS. Enjoy your self-guided tour. Install the S6 Truss. You are tasked with installing the fourth starboard Integrated Truss Segment (S6). Trusses are essential to the continuation of the International Space Station because they form the backbone of the station. Unfurl the S6 Solar Arrays. The space station's main source of energy comes from three of the four large photovoltaic arrays currently on the station, sometimes referred to as the Solar Array Wings (SAW). Can you assemble the fourth set of solar arrays to the station? Ride the Robotic Arm. There's a tear in the solar array! Can you ride the robotic arm then use the clamps to fix the tear? Retrieve Your Tools. You have used a lot of tools to do your repair work. Now many of them are scattered in space. How many of them can you retrieve before heading back to the airlock? Conduct SPHERES experiments. SPHERES are tiny satellites being tested by NASA on the ISS. Someday they'll help astronauts study space and possibly even assist with in-orbit construction projects. But first they must learn to fly in formation. Can you help the SPHERES navigate their way through the hoops in NASA's experiment? Restore Space-to-Ground Communications. The ISS has lost voice and data contact with mission control. Take a space walk to bring communications back on line by powering an auxiliary antenna. To play the game in your browser, follow the link below or click on the button at the top of the page. If you're trying Station Spacewalk Game for the first time, you'll see a link to download and install the necessary plug-in for your browser. Be patient, it may take a minute or two. Once the plug-in is installed, you're ready for your trip to the International Space Station! Would you like to create your own video game? Visit http://nasa3d.arc.nasa.gov to download free 3D models from NASA.